I have to admit, I find this argument not very compelling, but surprisingly, many skeptics do, and so I’ve tried to figure out what assumptions or beliefs about God made this seem compelling to some. Should Theism Be Evenly Distributed? If the knowledge of God (plain theism) is universally available, we ought to see a more even distribution of faith around the globe. The universality of religion in general seems to support the fact that the desire for God, if not the knowledge of the existence of God, IS universally distributed. 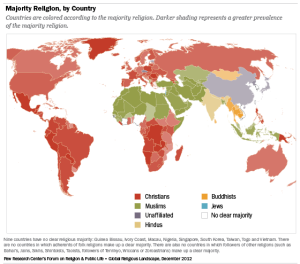 Should Christianity be Evenly Distributed, and Why? If God is omnibenevolent and wants a relationship with all humans equally, the distribution of Christian faith across the globe would be even. Therefore, the Christian God does not exist. God would not self-limit his revelation to human messengers, and his love requires that, since all humans probably seek god roughly equally, he would provide access to all equally, even if supernatural means were necessary. God is obliged to give every individual an equal chance at hearing and responding to the gospel. If election and regeneration are unmerited, unconditional and sovereignly given, we should not see an even distribution of Christian faith around the globe, and perhaps even spread evenly from many loci instead of the plodding path outward from Jerusalem (see this awesome Map of Religions and how they expanded and contracted across time). Therefore, sovereign, unmerited election is not occurring. Unconditional does not mean that there are no conditions that affect whether or not someone responds – it merely means that they do not have to meet any conditions of merit to hear or respond to the gospel. There may, however, be a host of embedded ideas, previous rejections of the gospel, emotional experiences, and even pure temperament that may make some individuals more resitant to the gospel than others. While God *could* overcome such impediments with a supernatural revelation, as he may have done with Paul the Apostle, he is not obligated by fairness or love to do so. I would argue that all factors and principles must be weighed in order to determine the proper outcome, if there is such a thing. Who is to blame for the uneven distribution of the Christian faith? failing to address the challenge or even to take it seriously. Again, one reason why Christians, including myself, respond with choice 3 above is because we fail to find the argument compelling – in fact, we are somewhat mystified by the interest in this fact, and fail to understand the many assumptions behind it that might lead one to expect a more even distribution. I suggest that it’s possible that God, desiring that all men should be saved and come to a knowledge of the truth (I Tim. 2.4), has so providentially ordered the world that anyone who would believe in the Gospel if he heard it is born at a time and place in history where he does in fact hear it. In that case, no one could stand before God on the Judgement Day and complain that, while he may not have responded to God’s general revelation in nature and conscience and so finds himself condemned, he would have responded to the Gospel if only he had had the chance. This is one of those arguments that is logically possible but so utterly anti-intuitive that it is almost instantly rejected by those of us, both Christian and not, who find this smacking of a convenient post-hoc argument.